Style of Protestant Painting in 17th Century Holland.  What is Dutch Realism?  What are its Main Characteristics?  What are the Most Important Dutch Realist Paintings? and other artforms, see: History of Art (800 BCE -present). (1632) By Rembrandt van Rijn. and Nautilus Cup (1660) By Willem Kalf. In fine art, "Dutch Realism" is a rather loose term which refers to the style of Dutch Baroque art that blossomed in the Netherlands during after the final phase of the Eighty Years' War for Dutch independence (15681648). Exemplified by the humanistic canvases of Rembrandt, the ethereal genre painting of Jan Vermeer, and the precise still lifes of Willem Kalf, Dutch Realism was a form of Protestant art which - in stark contrast to Catholic Counter-Reformation Art - avoided the monumental themes and idealized splendour of High Baroque painting, and focused instead on everyday themes portrayed in convincing detail. Due to the extraordinary quality of the art produced, the 17th century became known as the Golden Age of Dutch painting and its artists exerted a huge influence on representational art across Europe. What are its Main Characteristics? see: History of Art Timeline. There was no sculpture produced in 17th century Holland, to speak of - only painting. Early Protestantism was far less comfortable with statues than Catholic Italy, France or Spain. In contrast to large-scale Italian altarpieces, religious murals and quadratura painting - displayed in cathedrals, churches and other public spaces, most Dutch Realist art comprised small scale panel paintings, suitable for domestic display in middle class homes. Oil painting was used exclusively, following the traditions established by Flemish painters during the era of Netherlandish Renaissance Art (1430-1580). Unlike the grand, dramatic "high art" favoured by Rome, Dutch Realism is characterized by a more modest, down-to-earth approach. Put simply, Dutch artists focused their attention on ordinary Dutch people and Dutch houses. This approach was largely determined by the fact that the Protestant Church authorities in Holland were opposed to the embellishment of churches with altarpieces and the like. Dutch Realist artists were therefore obliged to turn to the growing Dutch middle class (merchants and traders) for their livelihood, and it was the taste of these merchants that shaped Dutch Realism. For a start, these merchants preferred paintings that showed off the material wealth they had managed to acquire. So they loved still life painting that displayed food, luxury plates, goblets, and so on: see for example "Still-Life with Nautilus Cup" (1662, Museo Thyssen-Bornemisza, Madrid). Next, being imbued with the 'Protestant' values of virtue and industry, they were fond of genre painting that showed womenfolk practising a skill - see "The Lacemaker" - or a musical instrument - see "Woman Playing a Lute near a Window" (1664, Metropolitan Museum, NY) - in the confines of well-kept houses. Most of all, the Dutch developed a fondness for portrait art: they liked to have their portrait painted - either as individuals, or in groups. For an individual portrait, see: "Portrait of Jan Six"; for a group portrait featuring people involved in textiles, see: "Syndics of the Cloth-Makers Guild" (The Staalmeesters). Dutch Realists used a form of detailed realism which derived from 15th century Flemish painting - in particular from works by Jan van Eyck (1390-1441), such as the secular "The Arnolfini Portrait" (1434). In addition, some realists were influenced by the naturalism of Caravaggio (1571-1610). In the composition of their oils, Dutch painters demonstrated a clear mastery of linear perspective, as exemplified in works by Samuel van Hoogstraten (1627-78), such as "A View Down a Corridor" (1662, Dyrham Park, UK). Another important characteristic of Dutch Realist painting concerns the representation of light, a feature that was handled quite differently by different artists. Rembrandt, for example, was greatly influenced by the chiaroscuro and tenebrism popularized by Caravaggism (c.1600-50). Vermeer, on the other hand, was interested in the effect of natural light and reflected light, from glittering reflections on metallic vessels or from white-washed walls. Unlike Rembrandt's dramatic use of light and shadow, Vermeer's treatment of light takes on an almost pearly veneer - an effect he obtained by a method known as "pointillé", in which layers of granular paint are applied to give a transparent effect. NOTE: Dutch Realism was adopted throughout the Netherlands, notably in the schools of Amsterdam, Delft, Dordrecht, Haarlem, Leiden, and Utrecht. As well as still lifes and portraits, the bulk of Dutch Realist genre painting contains a variety of moral lessons taken from the Bible. The category of "tavern scenes" - a genre exemplified in works by Adriaen Brouwer (1605-38), Adriaen van Ostade (1610-85) and David Teniers the Younger (1610-90) - provided a wealth of advice against drunkenness and self-indulgence, while works by Jan Steen cover a wider area still. Vermeer articulated his messages in a series of sublime interiors. For example, in his "Woman Holding a Balance" the empty weighing scale indicates that the subject is depicted weighing spiritual rather than material considerations. She is utterly serene in the self-knowledge that the righteous approach is to lead a life of moderation. NOTE: Another popular category of Dutch Realism consisted of the architectural church paintings of Pieter Saenredam (1597-1665) and Emanuel de Witte (1615-92). 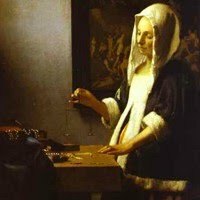 What are the Most Important Dutch Realist Paintings? - The Laughing Cavalier (1625) Wallace Collection, London. - Anatomy Lesson of Dr Nicolaes Tulp (1632) Mauritshuis, The Hague. - Danae (1636) Hermitage, St. Petersburg, Russia. - Portrait of Agatha Bas (1641) Royal Collection, UK. - Old Rabbi (1642) Szepmuveseti Muzeum, Budapest. - The Night Watch (1642) Rijksmuseum, Amsterdam. - Portrait of Hendrickje Stoffels (1650) Louvre, Paris. - Portrait of Jan Six (1654) Private Collection, Amsterdam. - The Syndics of the Cloth-Makers Guild (1662) Rijksmuseum, Amsterdam. - The Jewish Bride (Isaac and Rebecca) (1666) Rijksmuseum, Amsterdam. - Girl with a Red Hat (1666) National Gallery of Art, Washington DC. - Girl with a Pearl Earring (1666) Mauritshuis, The Hague. - Still Life with Musical Instruments (1623) Louvre, Paris. - Still Life with Skull (1630) Mauritshuis, The Hague. - Still Life with Roemer, Crab, Peeled Lemon (1643) Art Gallery of South Australia. - Still Life with Herring (1629) Mauritshuis, The Hague. - Breakfast of Crab (1648) Hermitage, St Petersburg. - Still Lfe with a Nautilus Trophy (1654) Magyar Nemzeti Museum, Budapest. - A Table of Desserts (1640) Louvre, Paris. - Still Life with Lobster (1648) MBB, Rotterdam. - Fruit and a Vase of Flowers (1655) Heritage, St Petersburg. - Pilgrim's Bottle and Two Golden Pitchers (1643) Wallraf-Richartz Museum. - Still Life with Porcelain Bowl (1654) Hermitage, St Petersburg. 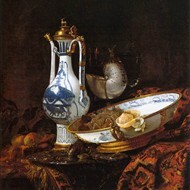 - Still Life with Chinese Porcelain Jar (1662) Gemaldegalerie, SMPK, Berlin. - The Butcher (1635) Pushkin Museum of Fine Arts, Moscow. - Fowl Still Life (1614) Wallraf-Richartz Museum, Cologne. - Still Life with Swan (1645) Pushkin Museum, Moscow. - An Allegory of the Vanities of Human Life (1645) National Gallery, London. - Still Life with Skull, Books, Flute and Whistle (1646) Kunstmuseum Basel. - Still Life with Earthen Jar, Fish and Fruit (1652) Rijksmuseum, Amsterdam. - The Ball Players (undated) Musee Royaux des Beaux-Arts, Brussels. - Brawling Peasants (1629) Mauritshuis, The Hague. 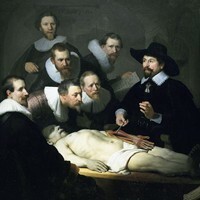 - The Operation (1631) Alte Pinakothek, Munich. - Maidservant at a Window (1640) MBB, Rotterdam. - The Mousetrap (1645-50) Musee Fabre, Montpelier. - The Supper Party (1617) Uffizi Gallery, Florence. - Christ before the High Priest (1617) National Gallery London. - The Concert (1625) Galleria Borghese, Rome. - Mother Lacing her Bodice Beside Cradle (1662) Gemaldegalerie SMPK, Berlin. - The Linen Cupboard (1663) Rijksmuseum, Amsterdam. - The Slippers (1654-60) Louvre, Paris. - View down the Corridor (1662) oil on panel, Dyrham Park, UK. - The Eavesdropper (1657) Dordrecht Museum, Dordrecht. - The Prodigal Son (1640s) Hermitage Museum, St Petersburg. - The Music Lesson (1658) National Gallery, London. - Village Feast (1635) Prado, Madrid. - Rustic Concert (1638) Prado, Madrid. - Interior with Peasants (1663) Wallace Collection, London. - The Lovesick Woman (1662) Alte Pinakothek, Munich. - Couple Flirting Outdoors (undated) Stedelijk Museum, Leiden. - Card Players Quarreling (1665) Gemaldegalerie, SMPK, Berlin. - Parental Admonition (1654-55) Staatliche Museen zu Berlin. - Woman Writing a Letter (1655) Mauritshuis, The Hague. - A Boy Delousing his Dog (1655) Alte Pinakothek, Munich. - Flute Players (1621) Staatliche Kunstsammlungen, Kassel. - Duet (1628) Louvre, Paris. - Country Wedding (1640-50) Galleria Doria Pamphilj, Rome. - The King Drinks (Twelfth Night) (1668) Prado, Madrid. - Apes in the Kitchen (1645) Hermitage, St Petersburg. - Gambling Scene at an Inn (1649) Wallace Collection, London. - Soldier and a Laughing Girl (1658) Frick Collection, New York. - The Milkmaid (1658-1660) Rijksmuseum, Amsterdam. - Young Woman with a Water Jug/Pitcher (1662) Metropolitan Museum, NY. - Woman Holding a Balance (1662-3) National Gallery of Art, Washington DC. - Woman with a Pearl Necklace (1662) SMPK, Gemaldegalerie, Berlin. - The Art of Painting (1666-73) Kunsthistorisches Museum. - The Lacemaker (1669-1670) Louvre, Paris. - Landscape with Cattle (1639) Musee des Beaux-Arts, Besancon. - The Sea by Moonlight (1648) Hermitage, St Petersburg. - View of Nijmegen (1649) Indianapolis Museum of Art. - The Forest (1664) Hermitage, St Petersburg. - Watermill (1667) Louvre, Paris. - The Jewish Cemetery (1657) Gemaldegalerie Alte Meister, Dresden. - The Mill at Wijk near Duurstede (1670) Rijksmuseum, Amsterdam. - The Little Street (Street in Delft) (1658) Rijksmuseum, Amsterdam. - Courtyard of a House in Delft (1658) National Gallery, London. - Aristotle Contemplating the Bust of Homer (1653) Metropolitan Museum, NY. - Bathsheba Holding King David's Letter (1654) Louvre, Paris. - The Conspiracy of Claudius Civilis (1661) Nationalmuseum, Stockholm. - Suicide of Lucretia (1666) Minneapolis Institute of Arts. - Return of the Prodigal Son (1666-9) Hermitage Museum, St Petersburg. - The Adoration of the Shepherds (1617) Uffizi Gallery, Florence. - Susanna and the Elders (1655) Galleria Borghese, Rome. Works reflecting the style of this art movement can be seen in many of the best art museums in the world, notably the Rijksmuseum and Mauritshuis in the Netherlands.  For more about 17th century oil painting in Holland, see: Homepage.